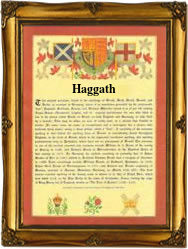 Recorded in the spellings of Haggath, Haggarth, Haggeth and Haggith, this interesting surname is English. It is a derivation either from the medieval English job descriptive words haggart or haggerter, which describe a trainer of wild hawks for hunting, or it derives from the pre 7th century Olde Danish Viking "Agard" - a locational name from the city of Agard in Denmark. Thiordly it is possible that the name is a nickname for a "wild and untamed" person, the derivation in this case being from the pre 10th century Olde French word "hagard", introduced by the Norman Invaders after 1066 . The surname development includes Anna Haggard who married James Crimble on October 8th 1684, at St. James Church, Dukes Place, London, Dinah Haggarth, recorded at the church of St. Mary Whitechapel on August 5th 1759, and Sarah Haggith, the daughter of Soloman Haggith, christened at St Pauls church, Deptford, Kent, on Christmas Day, 1792. Sir H. Rider Haggard, (1856 - 1925), wrote the ever popular book "King Solomon's Mines". The first recorded spelling of the family name is shown to be that of Alice Haggard. This was dated 1275, in the County Pipe Rolls of Worcester, during the reign of King Edward 1st of England, 1272 - 1307. Throughout the centuries surnames in every country have continued to "develop", often leading to astonishing variants of the original spelling.